So, you're an adult who is getting, or has recently gotten, braces. Welcome to the club! Lots of adults are taking the plunge these days for straighter teeth and improved bites. 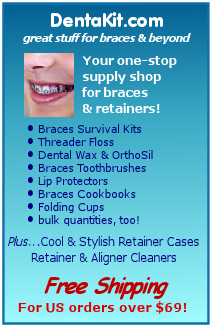 Braces 101 is a series of pages containing tips to help you survive the experience. Some of the information on these pages is from my own personal experience, and some is gathered from various dental sources on the Web. Remember, when in doubt, ask you own doctor. If you have tips or questions you'd like to share with other adults (no fetish posts, please), you can add them to the Metal Mouth Message Board. Part 6: After the Braces Come Off: Retainers!